This Secession congregation started before 1763 when Moira was linked with Hillhall (Lisburn). Services were held in a barn, situated on land owned by Mr. J. McCollum who came from Hillhall. Hillhall became independent in 1763 and Magheragall was then joined with Moira. The minister of the united charge was Rev. James Hume, a native of Aberdour, Fifeshire, who had been ordained in Moira on 30th January 1753, and it would appear that Moira took on Magheragall in 1763. Mr. Hume died on 12th October 1782 to be succeeded by Mr. Adam Gilbert. He was ordained on 16th June 1784 and died on 15th September 1804, “Deeply versed in Divinity and possessing a considerable fund of other useful learning”. The next minister of Moira and Magheragall was Mr. William Moffatt, a Lanarkshire man, ordained on 19th June 1806. He was the father of Rev. Walter Moffatt of Saintfield (1831-38), the “McCheyne of the Irish Seceders”. In 1841 the congregation was given leave to call an assistant and successor, but this was not done before Mr. Moffatt retired in 1843. He died at Ashley Place, Ballymacarrett on 25th October 1853 and was buried at Moira. It was many years before Magheragall became strong enough to go it alone. When it did so the first minister was Mr. Joseph Kelso. He was Moderator of the Anti-Burgher Synod in 1811 and came from Taboyne. He was ordained on 8th August 1809. In 1828 he petitioned Synod, seeking to be disannexed and to be certified to the American Church. The Synod replied by appointing the Presbytery to hold a visitation, which was done in due time, and in 1829 Mr. Kelso was suspended for intemperance and for celebrating marriages in an irregular manner. He died at Lisburn and was buried in Magheragall Burying Ground. Mr. Kelso was succeeded by Mr. John Smith Brown (lic. Down), son of Mr. Joseph Brown, Burren, Ballynahinch. He was ordained on 30th September 1829 and the following year he married the youngest daughter of the Rev. Samuel Edgar, Ballynahinch. He retired in 1877 and died on 5th August 1880 aged seventy-five. One son, Rev. Samuel E. Brown, was minister of Ballywalter, Athlone and Clough (Co. Antrim), and another, Rev. Wm. Wallace Brown, was a missionary to India. A daughter, Miss Susan E. Brown, was the first Zenana missionary to India of the Irish Presbyterian Church. The present church was built on the site of McCollum’s barn in 1840. Mr. Brown was followed by Rev. Hugh Hastings of 2nd Killymurris. He was installed on 15th May 1878, retired on 1st July 1913 and died at the Manse on 19th July 1928. Then came Mr. Hugh Jordan Lilburn, a licentiate of the Presbytery of Long Island, U.S.A. He was received as a licentiate and ordained on 23rd October 1913. He emigrated to New Zealand on 17th September 1928 for work under the Mission Board, resigning his charge here on that date. The Rev. Thomas Rodgers of Ulsterville, Belfast, was installed on 9th April 1929 and made a notable contribution. The Rev. Andrew Rodgers of Dungannon is a son. Rev. Thomas Rodgers retired on 30th September 1942 and died on 19th October 1949. Mr. Gilbert David Smith (lic. Derry) was ordained as Mr. Rodger’s successor on 25th January 1943 and resigned in order to emigrate to Canada (St. Giles, Peterborough) on 15th March 1953. His successor was Mr. Robert Dickson Larmour (lic. Belfast) previously assistant minister in Newington Presbyterian Church, Belfast, who was ordained and installed in Magheragall on 2nd September 1953. Mr. Larmour retired on 2nd September 1988 and is now Minister Emeritus of Magheragall. On 1st November 1988 he was appointed Minister for Pastoral Visitation at Hillsborough Presbyterian Church. Mr. Larmour’s successor, the Rev. John Honeyford, previously assistant in First Comber, was installed in Magheragall in 1989. He resigned on 31st December 1995 and is now minister of St. Columba’s Presbyterian and Methodist Church, Lisburn. Mr. Honeyford was followed by the Rev. George McClelland, previously minister of Lislooney, Knappagh Presbyterian Churches and stated supply to Middletown Presbyterian Church. Mr. McClelland was installed here in May 1999 and resigned on 30th April 2004 to take up a position as National Director for The Boys’ Brigade in Northern Ireland. Rev. Angus McCullough, previously in Second Ballybay and Rockcorry, Co. Monaghan, was installed in Magheragall on 8th April 2005. This was another Seceder congregation, which started before 1763 when Moira congregation was linked with Hillhall. Services were held in a barn, situated on land owned by Mr J McCollum who came from Hillhall. When the Rev James Hume resigned the Hillhall portion of the joint charge in 1763 he became minister of Moira and Magheragall. The first minister of Magheragall as a separate congregation was Mr Joseph Kelso who was ordained in 1809. During the ministry of Mr John Smith Brown (1829-1877) the present church was built on the site of McCollum’s barn in 1840. Mr Robert Larmour, now Minister Emeritus, was ordained and installed here in 1953. He retired in 1988 and is now Minister for Pastoral Visitation at Hillsborough Presbyterian Church. Mr Larmour was followed in 1989 by the Rev John Honeyford and in 1999 by the Rev George McClelland, who in 2004 was appointed National Director for The Boys’ Brigade in Northern Ireland. 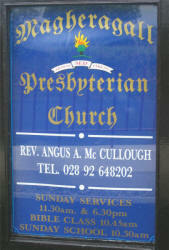 The present minister, the Rev Angus McCullough, was installed on 8th April 2005.